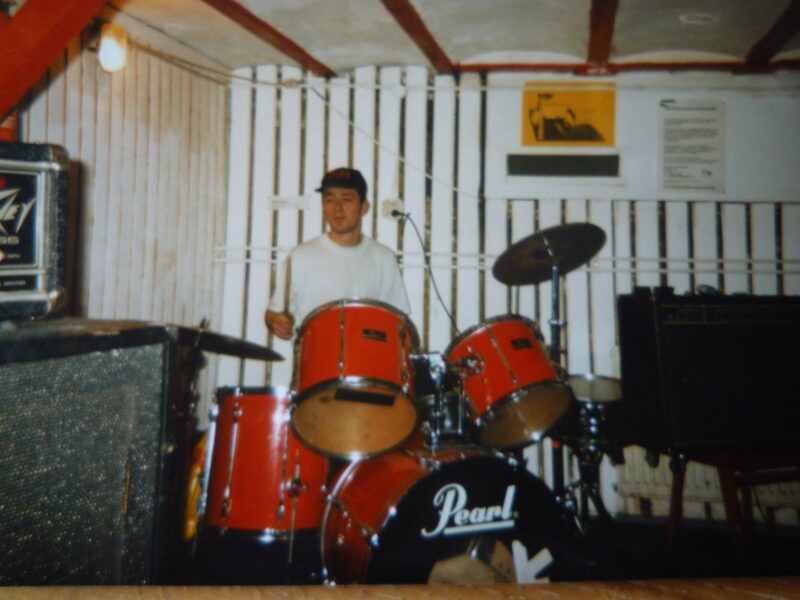 It was back in 1992 when I decided that 7 years of practising drums, most of the time on my one, was enough to be a bullet proof band member. I had some short experiences with a folk band which broke up after 2 rehearsals, and for 3 months a Van Halen cover band named Havoq, but now I was about to get serious. In ’92 I studied in Enschede and my girlfriend at that time was resident in Deventer so I gave it a shot in both towns. I made an A4 format flyer with a short notice of “being urgently in need of a proper band”. In order to point out that there were no mistakes to be made about my motives, I dropped like 30 band names witch I liked, to fill in the rest of the white space on the A4. I mentioned bands like The Police, New Model Army, Killing Joke, Zappa and Led Zeppelin. I nailed some posters in the Deventer ‘Burgerweeshuis” as well. Within a couple of days I already got a short call. I was happily expected on the next Monday for an audition in the Deventer cellars of the Burgerweeshuis. They were happy with my performance, after the formal candidate asked “should I play a rock rhythm or a disco rhythm” . I could bring in some more.. I succeeded and so I became the, like hundredth or so, and also last drummer of Nar-Cist. At the first rehearsal however it was made perfectly clear to me that one band on my list had made them shiver and should never be mentioned again… that band was Supertramp. It almost ruined my membership of Nar-cist. Nar-Cist – Showcase Gig in Amsterdam 2 November 19:00 Free Admission!